There are many sentiments going around about the issue of our sun. The recent eclipse on August 21st seemed to mark the beginning of significant energetic changes on the surface of our planet and throughout our solar system. After this historic occasion, there were also tremendous positive developments within the truth community and in societal grassroots activity. Along with such positive developments, there seemed to be various efforts by the powers that 'soon won't be' to disrupt and destroy the societal integrity which we the people have been establishing ever since we awakened. These energetic shifts appear to have also played a roll in producing numerous hurricanes directed toward the coastlines of North America with unheard-of consistency and destructive potential. Though these storms have been significant, their power seems to have been substantially mitigated by unknown forces. The recent changes also seemed to have released a series of scale-tipping solar flares at a surprisingly rapid pace. 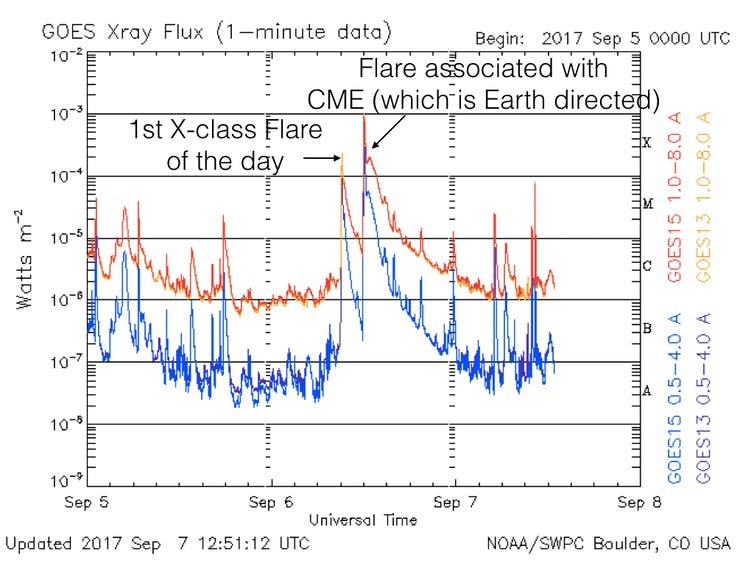 These X-class flares have been some of the largest seen in years and all seem to have taken place within the same two to three-week period. We can only guess as to what the reasoning is behind this collection of events, but I believe it is safe to assume that most, if not all of these events are linked. Galactic cycles are calculable and largely consistent according to astronomers. These cycles affect not only our sun, but they can affect our own consciousness as well. We know that the sun's position in our sky affects our consciousness on a daily basis. So what other solar systemic and galactic changes might affect our sun along with that state of consciousness? If the galactic cycles are as the ancient civilizations of Earth have calculated, and if we are truly living in end/beginning times, then we may all be witnessing the long-prophesied changing of the ages from one of darkness and lack to one of endless light and abundance. These changes would likely include significant energetic increases to our sun. These are simply possibilities, but according to my observations, those who have chosen to focus upon higher more positive perspectives and then to act upon them are making the most of the energetic changes, whatever the nature of those changes might be. 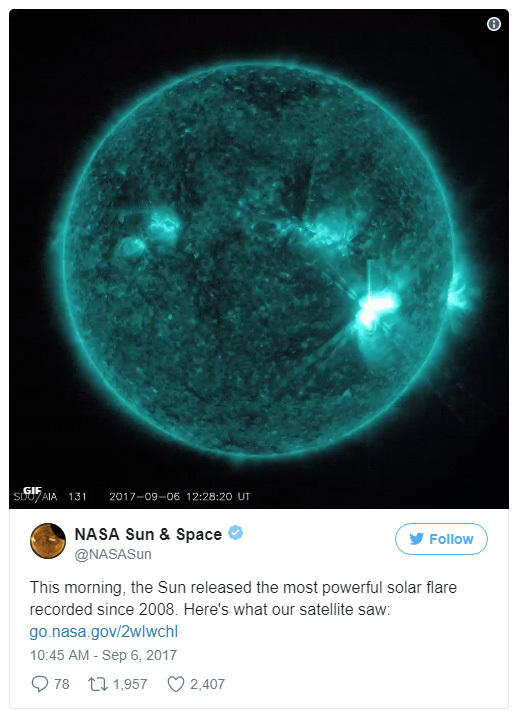 Image (above): A huge solar flare flashes in the middle of the sun on Sept. 6, 2017. A separate image of the Earth provides scale. If you still have your solar viewing glasses from the eclipse, now is a good time to slap them on and look up at the sun. You’ll see two big dark areas visible on our star. These massive sunspots are regions of intense and complicated magnetic fields that can produce solar flares – bursts of high-energy radiation. You can just make them out with solar viewing glasses, but they’re better viewed through a solar telescope. 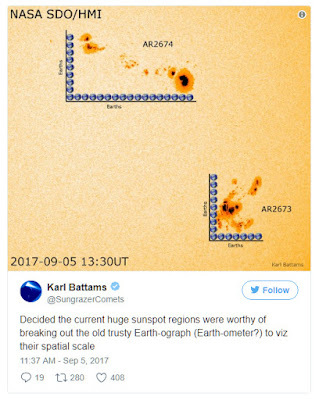 These two huge sunspots are currently causing quite a bit of consternation and interest. The solar storms they’ve sent toward Earth may affect communications and other technologies like GPS and radio signals. They’re causing amazing displays of the Northern and Southern Lights. And space weather scientists like us are excited because we wouldn’t normally expect this much activity from the sun at the moment. The sun goes through 11-year cycles of solar activity. 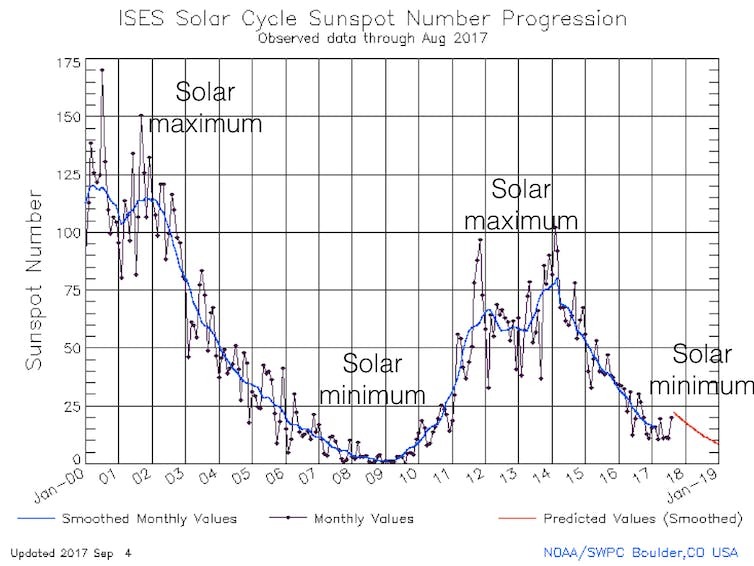 What scientists call a solar maximum is the time in the cycle when the sun is putting out the most energy. That’s when we tend to see the most sunspots, solar flares and associated solar storms. Some solar maxima are larger or more active than others – such as the 1990-1991 solar max. But this last cycle, which peaked in 2014, was quite small, and there were few large geomagnetic storms. 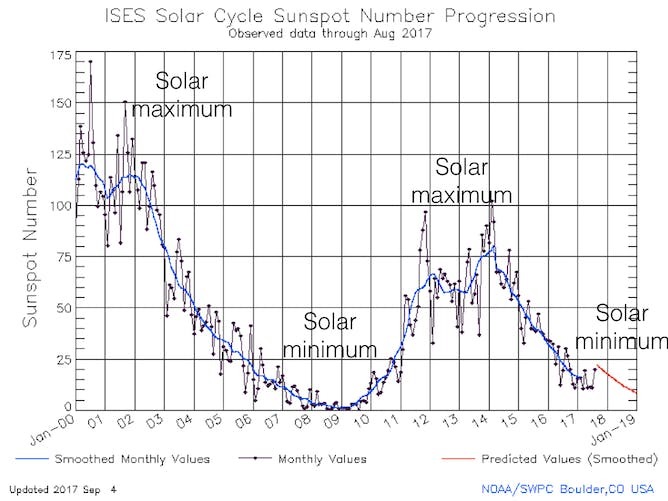 We’re heading into the bottom of solar minimum, when the sun tends to have fewer sunspots, solar flares and coronal mass ejections – large expulsions of plasma, electrons and ions, and magnetic fields. But despite where we are in the sun’s cycle, activity on the sun has dramatically picked up over the past few days. On and off, these two sunspots have been flaring and shooting out coronal mass ejections, directed toward Earth. 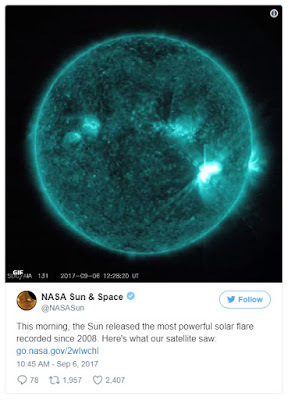 So what’s going on with the sun? And should we be concerned about this somewhat out-of-character solar behavior? The sun continued to flare on September 5. 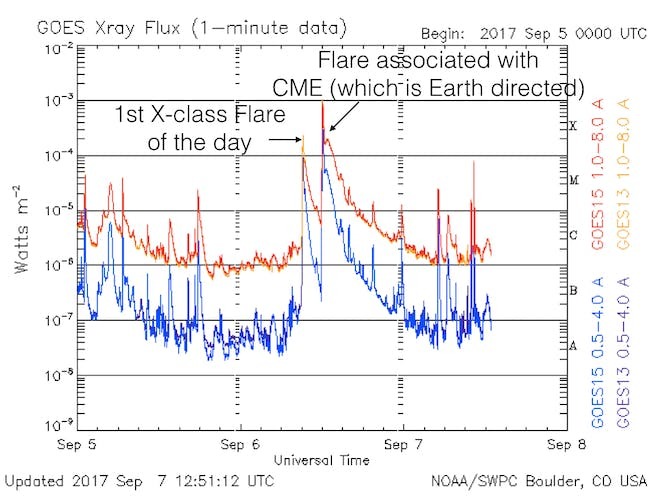 A solar energetic particle event from the previous day’s activity arrived at the Earth, where it likely affected radio communications as well as the health of satellite systems. Over the next day, the same sunspots continued to spit out more solar flares. It took about an hour for the solar energetic particles they emitted to arrive at Earth. These protons are incredibly fast-moving. They can affect communication systems, typically in the polar regions where they are more likely to enter into the Earth’s atmosphere. As with all increases of radiation in space, they can also affect satellite systems and the health of astronauts. Early in the morning hours of September 7 in the U.S., that first coronal mass ejection that erupted from the sun three days earlier arrived at Earth. Because of the way its magnetic field aligned with Earth’s, it generated only a small geomagnetic storm.